Fife Flyers hopes of a winning start to their Belfast weekend bit the dust with a devastating three-goal burst in 80 second turned this game on its head. Two of them came on a five-on-three powerplay as Belfast Giants ripped open a tight hockey match, and never really looked back. In total they hit the net three times in just over 80 seconds, and then wrapped up a 6-3 win with an empty net goal in the dying moments. Flyers took a decent support across the Irish Sea for the double header, and they saw their team tie the opening period, but, ultimately, the better side won. Opportunity and execution were key to a Giants side which looked dangerous across several spells of sustained pressure which saw Shane Owen kept busy with key saves to deny the impressive forwards. Marcus Basara sat out as a healthy scratch, and Fife made a good start with Joe Basaraba turning up the pace, driving the net and going on the backhand for an early chance, before Dannick Gauthier opened the scoring at 4:56 with a gem of a wraparound. Chris Higgins had Giants level after nine minutes – a puck off the back boards, and his shot found a way under Owen. They then cranked up the pressure and went ahead after 13 minutes as Fife couldn’t clear their zone, allowing Jonathan Ferland to net with his shot on the turn. Gauthier sent Fife into the break on level terms with a goal 16 seconds from the buzzer - no more than Fife deserved for their opening period, but the middle period belonged to Giants. They created the better chances, racked up the pressure, and ruthlessly exploited a five on three powerplay to completely change the shape of this game. Paul Crowder was called for hooking and, on the delayed penalty, Brett Bulmer also took a minor for kneeing. Two goals, and one shift later, Fife were firmly behind the eight ball. Kyle Baun made it 3-2 at 30:122, and, just 23 seconds later turned provider for Curtis Leonard to ring the red light. When Jonathon Ferland made it 5-2 at 31:43, Fife called an immediate time-out. “We needed to steady the ship,” said coach Todd Dutiaume. 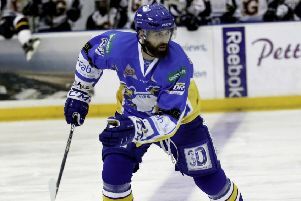 Fife grabbed a lifeline in the closing seconds as a quite horrid defensive play by Giants was seized upon by Mike Cazzola, and Basaraba swept the puck home. At 5-2 Belfast were in control. At 5-3 they left the door open to Fife in the final period. With Higgins and Gaun tormenting Fife’s defence, the home side missed some huge chances before Adam Keefe called a time out early in the third. Clearly he wanted this match put to bed. But the coach had to be patience. The clock was winding down to the buzzer when, with 57:12 played, Fife pulled Owen for the extra skater. The goalie had barely taken a few steps when Blair Riley hit the empty net for 6-3. The teams play again on Saturday before Fife head home to host Cardiff Devils on Sunday night.